Diet is a brick and mortar of health. As humans are concerned about their healthy diet, most feline owners urge to provide the same for their lovable companions. Nevertheless, with lack of knowledge or unaware of the factual things, many cat owners fall in the wrong pit in feeding their feline friends. However, many concerned pet parents have lots of questions in their mind regarding the cat food in order to find the perfect answer for them. Unfolding here some of the most common questions that pet owners have with reliable answers from the vet’s desk. Can we give chicken to cats? As cats are carnivorous, meat is the safest human food that we can give to them. Moreover, cooked poultry is the best choice. As chicken has high nutritional value, it can be good for cats. The meat protein helps maintain strong heart, good vision and a healthy reproductive system. Cooked chicken, beef and turkey and lean deli meats can be given to cats. Human foods – grapes and raisins are healthy snacks for humans, on the other hand, it can be a potential health threat for your cat. By eating grapes, your cat may develop sudden kidney failure. Hence, avoid giving it to your cat. Can cats get sick from eating raw chicken? Cooked chicken is good for cat’s health but when it comes to raw meat; it is not at all preferable. Raw chicken brings with it numerous germs that can be a danger to cat’s health. It can make your cat sick. Can a cat eat dog food? 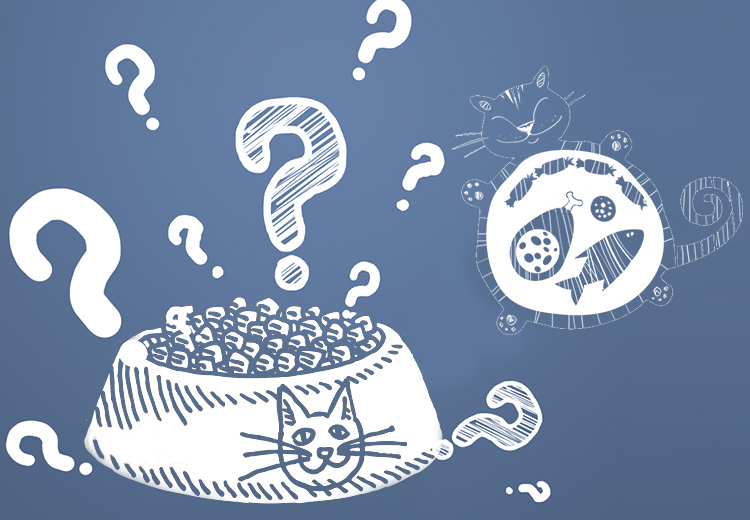 When it comes to nutritional content, it varies for both dogs and cats. Cats’ diet should have special type of amino acid called ‘taurine’, whereas dogs are capable of making this nutrient naturally on their own. A cat eating food deficient in taurine can develop severe health problems including heart disease. Therefore, all cat food contains additional taurine. Cats require a different type of vitamin A compared to dogs. Hence, a cat eating a dog food can definitely risk their health. This is quite a common concern in most pet parents. Well, the amount of your cat feed depends on your cat’s age, health and preference. Feeding your cat wrong food or too little will deteriorate his health. Moreover, a growing kitten requires more amount of good diet with high fat content whereas an ageing cat requires low fat healthy diet in lesser portions. This is yet another concern next to how much should pet parents feed their feline pals. How often they need to feed their cat. Again the frequency of feeding your cat varies according to the age and health condition. Growing kittens up to six months of age may require three meals a day. On the next stage, from age six months to maturity, most cats will do well when fed two times a day. And, once the cat is adult at about one year old, feeding once or twice a day is sufficient in most cases. Whereas, when your cat reaches adulthood, feeding once a day is appropriate as long as they are healthy and have no health issues. In case, your feline has any health condition, prefer to take your vet’s advice.